Although both the full size Echo and the Echo Dot have respectable sound for their given sizes, compared to much bigger tabletop Bluetooth speakers (or a full home theater system with Bluetooth support), they’re pretty anemic. Let’s look at how you can link them to bigger and more robust speakers. This is not a tutorial on how to use Bluetooth to send music to your Echo (e.g. to play music from your phone)—this is a tutorial on how to send the audio from the Echo to bigger speakers. If you’re interested in using your Echo as a Bluetooth speaker, please check out our tutorial here instead. To achieve an Echo-to-speaker configuration, you’ll need a few things. First, you’ll need the Echo device (obviously). Second, you’ll need some sort of Bluetooth speaker system to connect to it. Although your speaker choice can be as simple and compact as a beefy tabletop Bluetooth unit (like the Nyne Bass we showcased in our guide to buying a portable Bluetooth speaker), truly anything that offers Bluetooth connectivity and good speakers is a potential candidate. If you have a sound bar with Bluetooth connectivity, for example—a feature we highlighted in our sound bar buying guide—you can link your Echo to your sound bar. 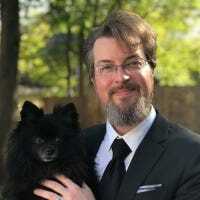 In fact, even if you have an old but still great sounding test of floor speakers, you can connect your Echo to them via Bluetooth with a simple Bluetooth-to-analog adapter, like the one we use in our guide to adding Bluetooth headphones to your HDTV. It’s worth noting, however, that the Echo Dot has a physical audio out jack, whereas the full size Echo does not—if you’re happy putting the Echo Dot right near the speakers and want to skip jumping through the Bluetooth hoop, you can simply use a male-to-male 3.5mm headphone cable to link the Dot to your speakers. (This will result in better quality, too, as Bluetooth does sadly degrade audio quality somewhat.) Full-size Echo users must use Bluetooth. Once you’ve decided on your speaker setup (which is, by far, the most time consuming part) it’s onto the easy part: pairing your Echo device to those speakers. Plug in your speakers and/or the additional Bluetooth adapter, if present. Plug in your Echo device nearby (anywhere in the general vicinity is fine, Bluetooth has a range of around 30 feet). 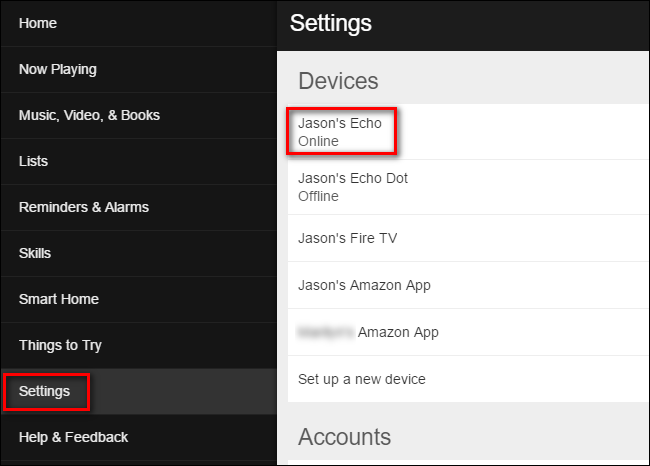 Grab whatever device you normally use to access your Echo’s settings (e.g. your iPhone with the Alexa app installed or your laptop with alexa.amazon.com loaded in the web browser). First, put your Bluetooth speaker or adapter into pairing mode. This is different depending on your particular device, so consult the user manual or Google the model number to check the instructions. Second, access the Alexa control panel via your phone or a web browser. Click on Settings and then select the Echo device you wish to pair from the “Devices” list. In the first subsection, labeled “Wireless”, click on “Bluetooth”. Here you will see any previously paired devices, including any devices you’ve paired to the Echo in order to use the Echo as a Bluetooth speaker (like the “iPhone” entry seen below). To pair a new device, click on the blue “Pair a New Device” button. Now is the time to put your Bluetooth speaker in pairing mode. Your speaker should appear is the list of available devices, as seen below—click on it. If your device doesn’t immediately appear, make sure a device you’ve previously paired with your speaker (like your iPhone) has Bluetooth turned off—many devices will immediately reconnect to any nearby previously paired device is possible, skipping the pairing mode altogether. After you’ve selected your speaker, you’ll see the speaker listed in the Bluetooth devices. Make a mental note of what the speaker or adapter is called. 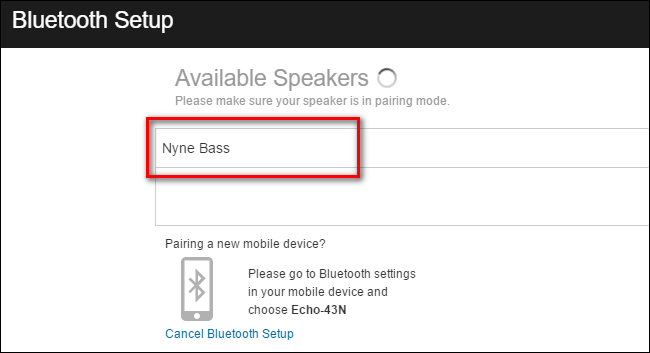 That way, if your Echo disconnects for some reason you can always give it a verbal instruction to reconnect to a nearby and previously paired Bluetooth device by saying “Alexa, connect to Nyne Bass” (or whatever your speaker is called). Once the pairing process is complete, your actual Echo unit still acts as the input for all commands but the output will come from the paired speakers. The nice thing about Bluetooth is that it allows you to put the Echo device practically anywhere within the roughly 30 foot range Bluetooth affords. This means if the speakers are in the den next to your kitchen, but 90% of the time you’re in the kitchen issuing commands to Alexa while you’re preparing meals or eating breakfast, then you can easily place the Echo in the kitchen where Alexa can hear you clearly. Although Amazon recommends you put at least 3 feet of space between the speakers and the Echo device (because very close proximity can make it difficult, while audio is pumping out of the speakers, for the microphone array to properly pick up your voice commands) we found that their concern was a bit overblown. As long as you don’t set the Echo directly in front of a pair of cranked up speakers, there’s little concern. Place the Echo device where it makes most sense for your daily usage and as long as it’s not sitting right in front of the speakers or getting rattled around perched a top your subwoofer then things should work just fine.